In today’s hyper-competitive cloud economy, it’s important to be first to market to gain a competitive edge. This makes organizations prefer agile development techniques like continuous integration and continuous delivery (CI and CD) to the traditional waterfall approach to building software. 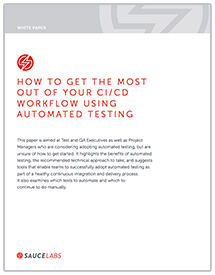 Automated testing is an integral part of the continuous delivery pipeline. However, despite the acknowledged benefits of automated testing, ground reality is that most organizations still use outdated manual testing processes. The initial effort required to setup an automated testing process makes teams want to avoid the pain, and make do with manual testing. However, to benefit from automated testing, it’s important to use the right tool, the right framework, and the right technical approach.